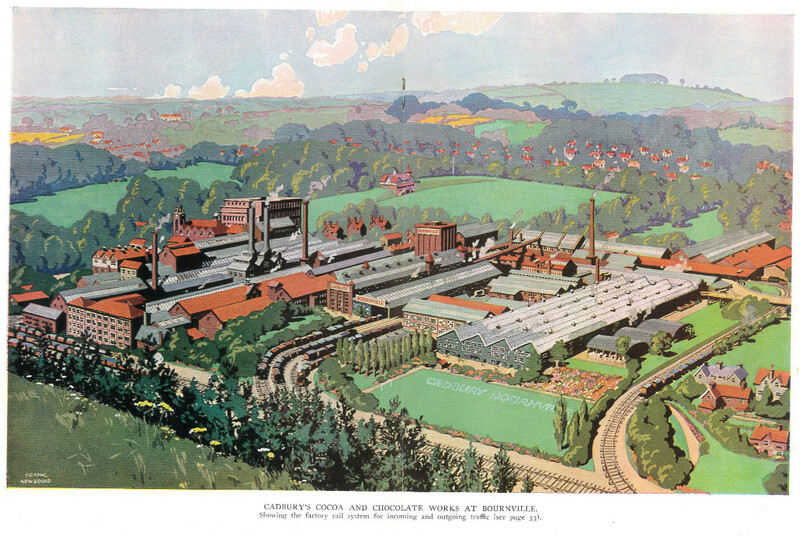 I recently came across this wonderful cover of a publication advertising the Bournville model village outside Birmingham, established by Cadbury family (we have a small series of them in our New Town boxes). 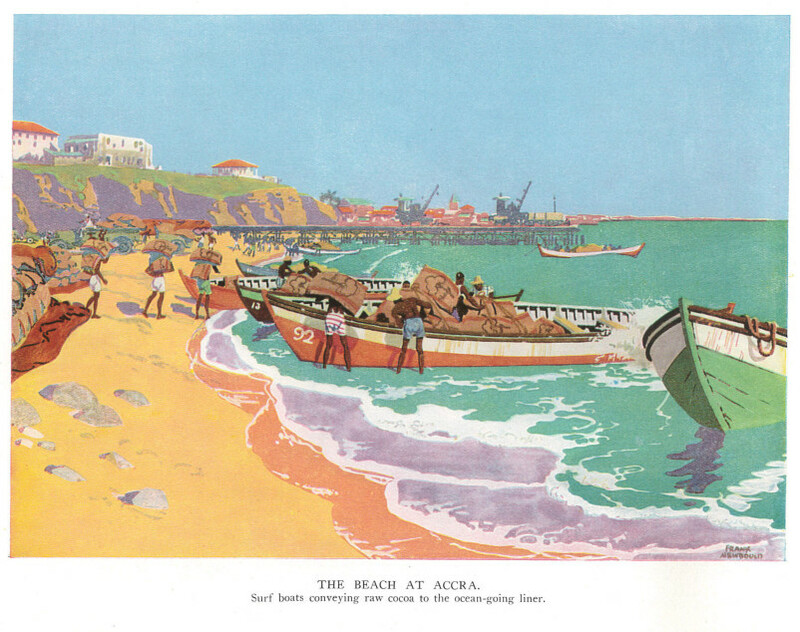 Inside were depictions of the cocoa supply chain from Ghana to the British midlands, with further beautiful pictures by the artist Frank Newbould (1856-1944), most famous for travel posters. 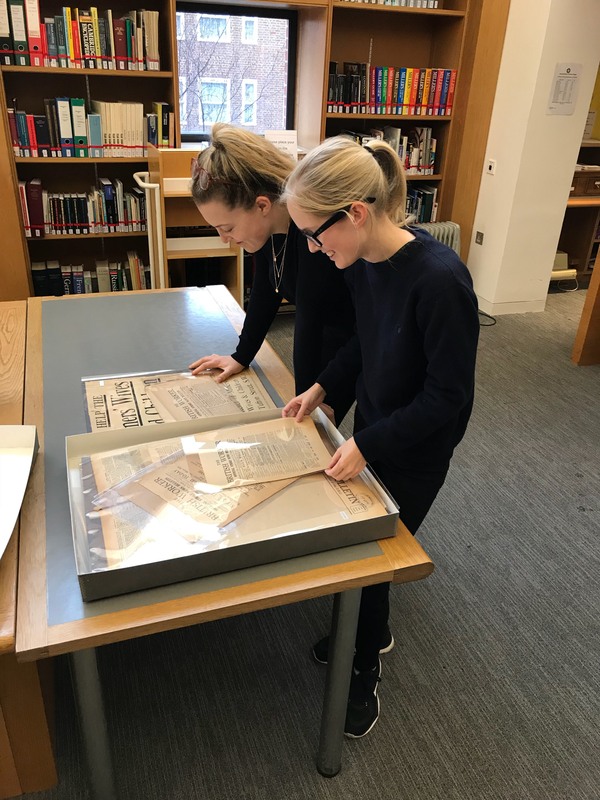 Kings College student Gina Teslo and Emily Hopper (SOAS) look at our General Strike collection http://www.unionhistory.info/generalstrike/index.php as part of their studies into Ellen Wilkinson’s book Clash. 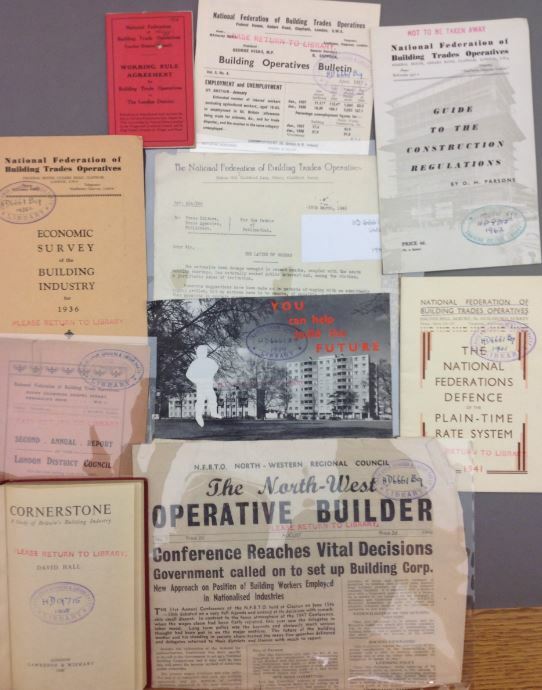 Groups of students have been visiting over the last two weeks to look at primary sources illustrating the various forms of communication that occurred during the nine days of the strike, including TUC leaflets, progress reports, examples of local reports from Leeds Trades Council, letters of support (including one from Leonard Woolf), telegrams, and posters. 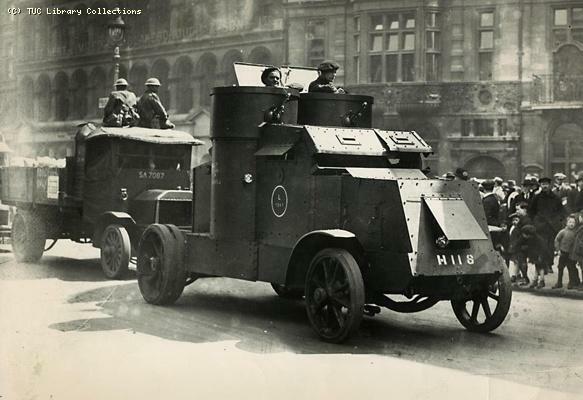 They were given the opportunity to hear an interview with Harry Watson (from the oral history collection) in which he describes the activities of the strikers in Canning Town attempting to enforce the picket around the Victoria docks, as they witnessed the armoured cars accompanying the goods being taken from the docks. This was part of their studies into the background behind Ellen Wilkinson’s novel Clash. 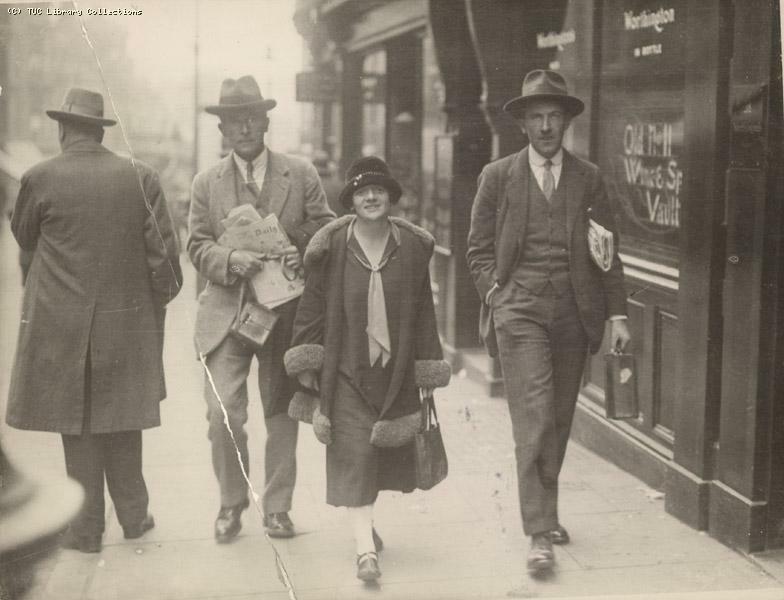 Ellen Wilkinson was national organiser for the National Union of Distributive and Allied Workers and MP for Middlesborough East during the General Strike. She spent the nine days travelling round the country speaking at public meetings and sending enthusiastic reports back to the TUC. She later wrote Clash about her experiences. I visited UK from 20th august to 15th September, 2018 for my archival work funded by the Charles Wallace India Trust. My thesis titled ‘Juridicality of Labour in India 1947-80’ looks at the growth of labour relations and policies formulated to deal with post-independence challenges. Specifically focusing on the establishment of industrial tribunals and labour courts to counter the rising number of strikes. Tribunals aimed to introduce a new way of dispute resolution and changed the discourse of labour relations. Workers resisted these states’ led mechanisms of labour management. Their expectations and demands were represented to a certain extent through the union representatives in the official circles. But it is through the court proceedings that we can get a greater insight into the ways that workers used such institutions. In the court cases the workers acted independently, and through unions, to negotiate their terms and nature of work. By using examples of case proceedings from Delhi I will bring out how workers were able to access the courts/tribunals. And their implications on changing dynamics of labour relations. My work was based in the trade union and labour archives I consulted in the London Metropolitan University’s Special Trade Union Collection. I prerequisited my material and it was ready for consultation when I visited the reading room. They have online and hard bound catalogues for reference which are very easy to use. They let you order as many files as you wish or need in the day. You can reserve and keep the files on the table to use next time. The staff over there were very friendly and helpful with everything from planning the visit there to directions for reaching the archives. My weeks over there were wonderful and very comfortable to carry on my research. 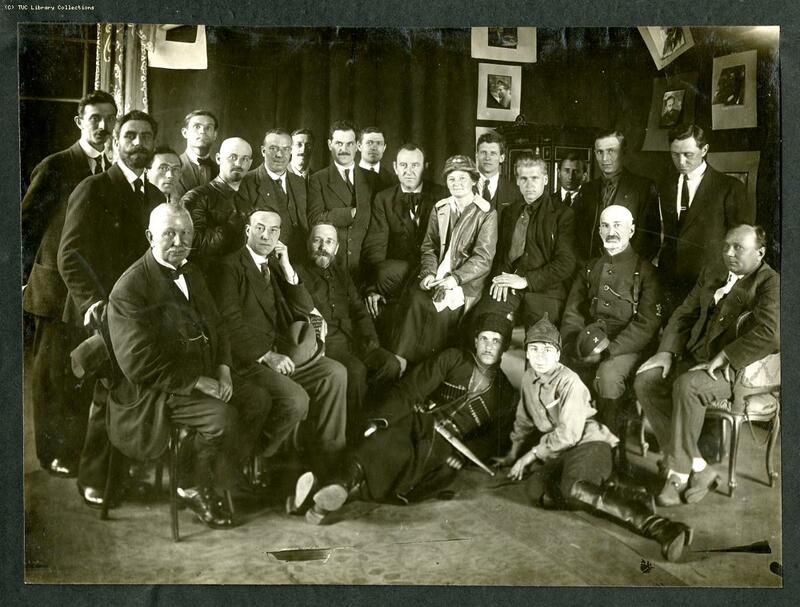 Among the collections I accessed there was Marjorie Nicholson’s special collection who was a British trade unionist interested in the Indian labour movement. I researched the material she found in India during her visits. As well as her notes to these resources inclusive of secondary and primary records. This made the collection extremely insightful and relevant for my thesis. 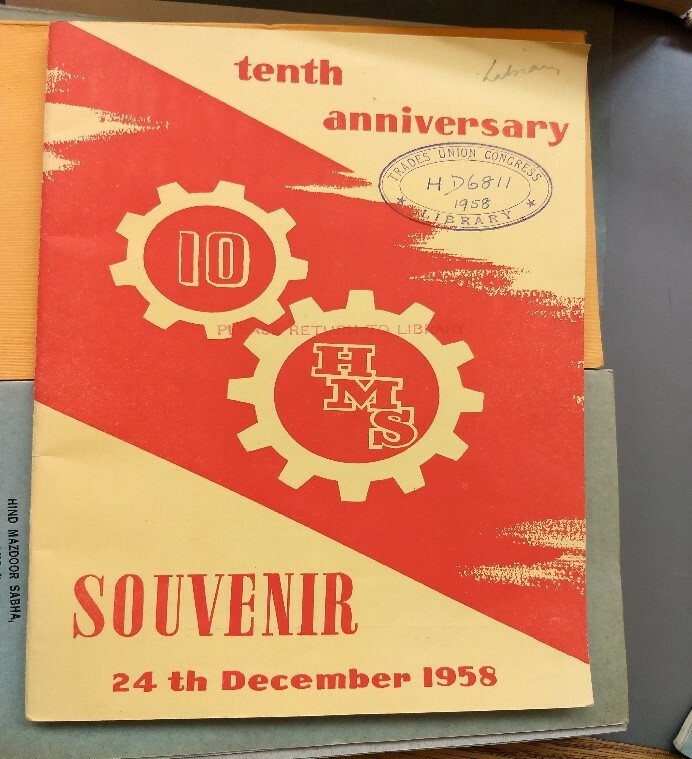 The archives also included field notes from her conversations with trade unionist and Indian policy makers detailing the scope and growth of trade union in India. It gives a quick recapitulation of the entire Indian working movement along with the future plans as remembered and shared by eminent trade union leaders. A critical phase of the labour relations was when the British administrators and trade unionists tried to help their counterparts in India. The British model of trade unionism was taught in India with the hope that the model could be emulated to an Indian setting. There is a very thin archive on this theme in India making it difficult to develop my chapter further. The TUC Library’s archives filled this critical gap in my research and gave new insights into how communications between the two countries were progressing. And their implications on the labour relations. There were rare reports of the British administrators’ visit to India to understand and survey the conditions of trade unionism. There is also a rich collection of the trade union pamphlets and research bulletins by various political parties; such as the Indian Trade Union Congress, Hind Mazdoor Sabha, All India Trade Union Congress and Indian Federation of Labour. These parties regularly came out with bulletins of information regarding their past activities and engagement with workers across different establishments of production. Along with economic and development plans for the future. All of these pamphlets and booklets were neatly arranged in the TUC Library for scholars to access and read. The rich selection of material gives a comprehensive view from below i.e. of workers; to counter these narratives there were equally well-preserved records from the research institutes of Labour in India. These were set up by the Government of India to monitor and regulate the capital and labour relations. Detailed cases studies conducted by Indian Labour commissioners to figure out the best model of labour and management relations that could be adapted to India. Most of these institutes and parties are no longer functioning which has made it impossible to find their records anywhere in India. 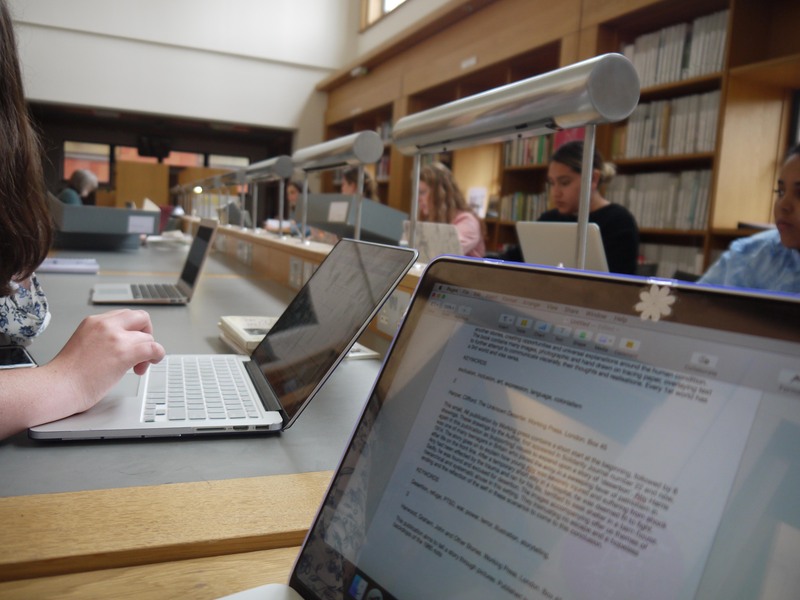 In the TUC Library, the workers’ world comes to life when you sit reading their publications. Including workers’ descriptions of their conditions of work, aspirations for their future generations and hope from the current government. These journals are critical for understanding the life and times of workers, and how they were able to negotiate their demands and expectations with government and their employers. For any researcher dealing with the issues of labour, development and specifically trade unionism this Library offers an integral repository. By allowing quick access to the material as well as preserving material spreading over several years covering various events of political and industrial significance. G.D.H. Cole (1889-1959), an Oxford don, had been a research officer (as a conscientious objector), for the Amalgamated Society of Engineers during WW1. He was one of the brightest and most committed pro-union socialist intellectuals of the early to mid- twentieth century. He would become Chichele Professor of Social and Political Theory at Oxford, but remained active on the left of the Labour movement for decades. He wrote extensively on every aspect of trade union affairs, The Labour Party and Socialism, as well as producing biographies of historical figures such as William Cobbett and Robert Owen, in a lucid style which influenced generations of activists. 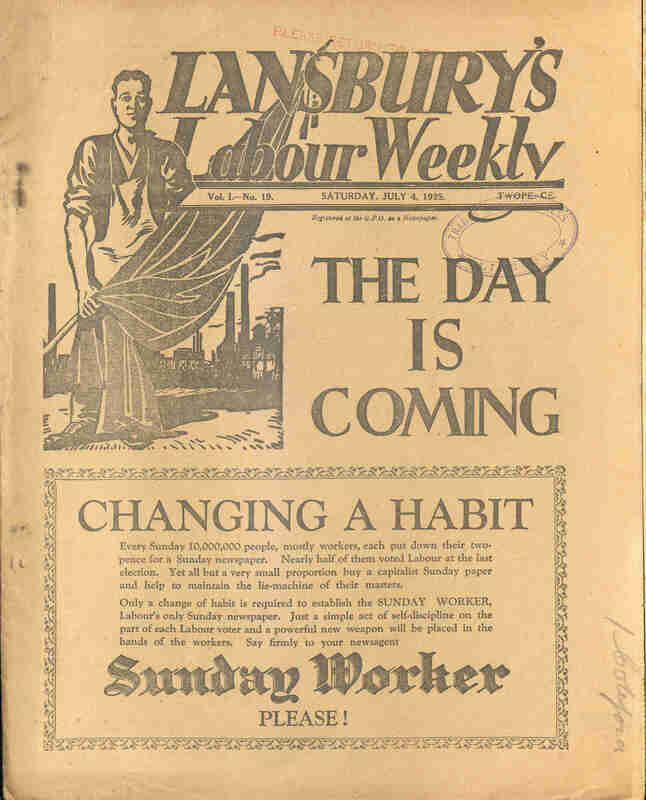 In 1925, he was promoting Guild Socialist/Workers Control ideas and wrote a piece entitled, ‘Organise the Workshops’ for [George] Lansbury’s Labour Weekly of 27th June. 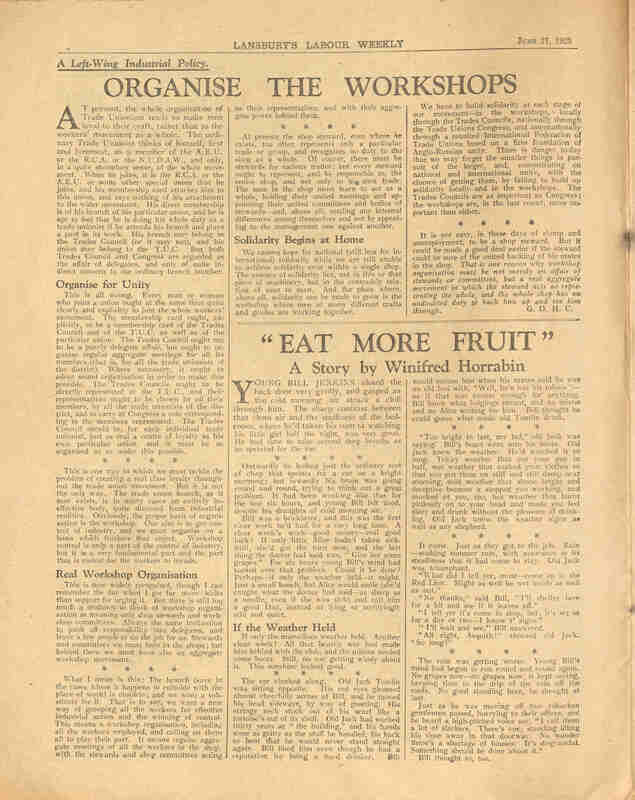 In it, Cole urged the trade unions to ‘Organise the Workshops’ for a ‘A Left Wing Industrial Policy’. He was critical of the unions’ tendency to “make men loyal to their craft [or sectional group of workers], rather than to the workers’ movement as a whole”. In his view, workers should be reminded that their union card committed them to a class loyalty with wider industrial objectives. The branch structure of the unions he saw as ‘entirely ineffective’ and ‘obsolete’ for this purpose and instead suggested that they should organise on a workshop basis to get control of industry. Shop stewards (then becoming common) should represent the whole shop rather than a particular trade or group. Such gratuitous advice would not be well received, even today! 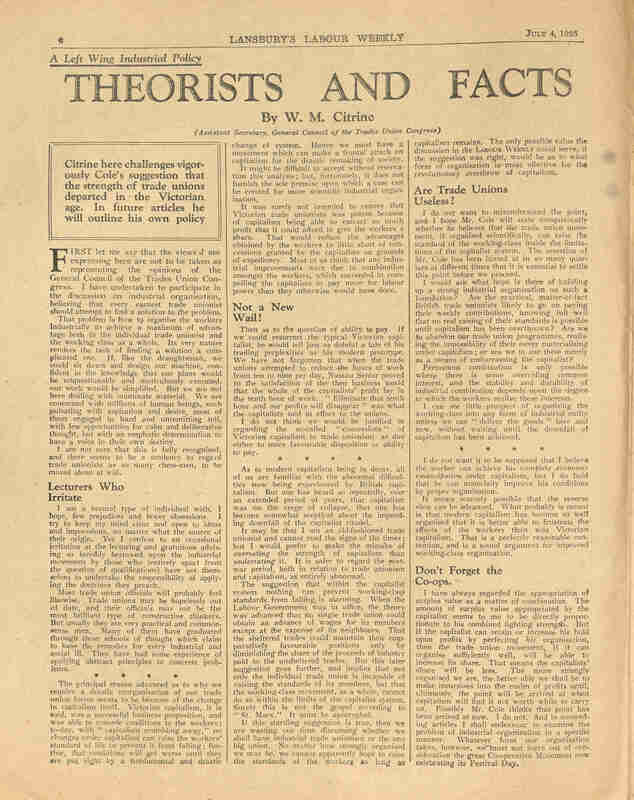 The week after (July 18th), Labour Weekly, carried a reply from Cole, whom Citrine had challenged. He urged Citrine not to be so touchy, citing his own credentials for entering such a debate! He said, ‘I fancy I have earned [it], both by study and by work for the Trade Union Movement’. He went on to clarify that it was not his intention to demean the contribution which the unions had made since the 1850s. They had forced Victorian British capitalism to concede the improvements which had been made to the standard of life of all workers. But now, he believed, they had entered a new stage of capitalism in which their ability to pay was curtailed, especially by the burden of War Debt and the power of finance capital generally to which employers were increasingly beholden. It was in those new circumstances, he believed, that traditional union organisation, however strong, would not be sufficient. Instead, ‘a frontal attack on the rights of property’ was needed, preferably through parliamentary action, but if necessary through revolutionary force. It is a reflection of the mood of the time in the trade unions, that Citrine in his further response, (July 25th), did not return to the fundamental argument which he had first raised. Instead, he declared himself satisfied by Cole’s ‘well-reasoned and frank reply’ that ‘the difference between us is not fundamental’! Now he gave a short tutorial on the different types of union structures there were, (citing the famous Heinz boast in his heading, ’Our 57 Varieties’) and how complex it all was. He had been given the job of sorting out the different union perspectives on the best future structure by the Hull Congress! It came to nothing by 1927, as all the craft, industrial, occupational and class type unions were quite happy with what they had built over the years. 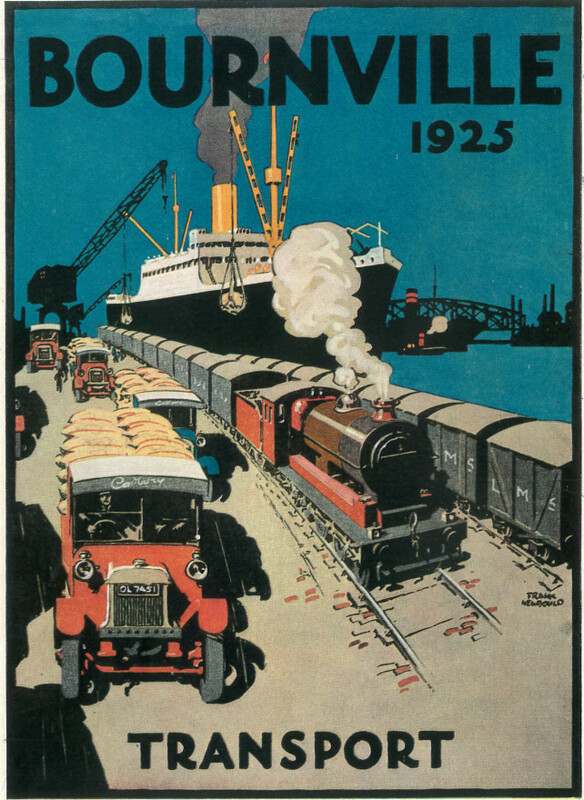 A few days later, July 30th, (‘Red Friday’), the threat of coordinated industrial action by the ‘triple alliance’ of railway, road transport and miners’ unions, forced the Conservative government into substantial concessions in the coal industry. However, in less than a year (May 1926), a better-prepared government forced the TUC into a humiliating retreat ten days into the first and only British General Strike. The syndicalist philosophies of the previous two decades were tested to destruction. It was ‘back to the drawing board’ for the unions and the TUC. Walter Citrine emerged from this cauldron to lead the TUC in an entirely different but highly successful direction. But maybe Cole wasn’t so far out really, in calling for a workshop/office-based unionism along with Citrine’s ‘adequate participation of the workers in control and management’. We are still waiting, nearly a hundred years on! Guest bloggers Dr Jessica Pauszek and Syracuse University Fellow Vincent Portillo describe their recent visit, along with their summer school students from the Syracuse University’s Studies Abroad Programme, which took place over a month between May and June 2018. This is the third in a short series written about their visit and the work they have been doing on the Federation of Worker Writers and Community Publishers. 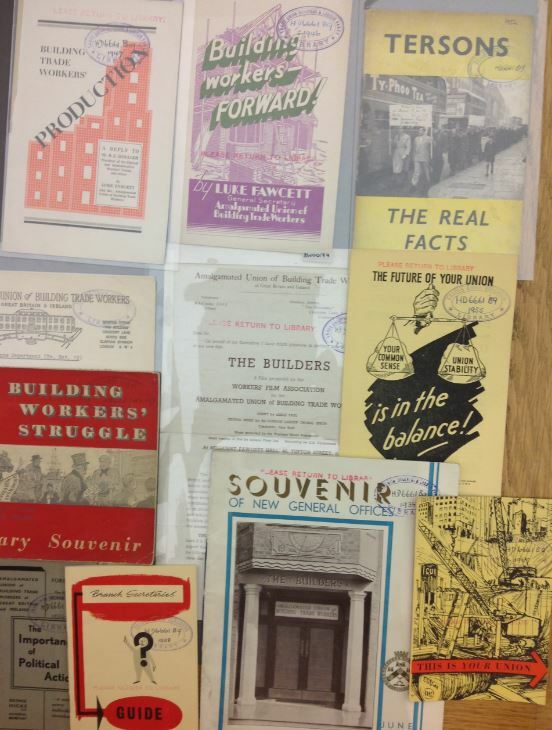 In our first two blogs (here and here) about building the Federation of Worker Writers and Community Publishers (FWWCP) Collection at the TUC Library, we talked about themes of mental health, gender, and sexuality as working-class concerns. Here, we are going to talk about the material concerns of migration as evinced by FWWCP working-class writers, specifically focusing on the roles food and language play in these stories. Throughout its 40+ year span, the FWWCP sponsored working-class writing groups in multiple areas of London where it originated in 1976. During this time, the FWWCP also gained global membership. Writing groups were forming, for example, in Australia, Canada, France, Germany, Spain, South Africa, and the United States. As people moved between countries, the FWWCP became an outlet for immigrant writers to share their stories, representing writing across national, cultural, and linguistic borders. Still, the greatest concentration of FWWCP groups remained in England. Sometimes, immigrants started their own writing groups; other times, they joined already existing groups. Regardless, through their subjectivity as immigrants, they shifted the focus of working-class writing. Rather than solely addressing the concerns of the dominant White, Protestant, English citizen, the FWWCP became a space for the disenfranchised of numerous nationalities, ethnicities, and languages to speak out and have their stories heard.Some groups such as the Ethnic Communities Oral History Project focused on immigrant histories through oral histories and interviews. Other groups such as Centerprise, Commonword, Peckham Publishing Project, and Pecket Well College integrated migration stories alongside other topics such as education or gendered identity. Within these writing/publishing groups, the narratives range from Bengali, Caribbean, Polish, Irish, Iranian, Greek-Cypriot, Welsh voices and more. Interestingly, writers did not only express their own concerns related to migration — the exile and nostalgia felt from leaving their homeland, family, and friends — but they also discussed absences that play out in daily life. For example, it wasn’t always easy finding ingredients, or even the utensils to cook food from the home country. One graduate student, Gabriela Arguindegui, was interested in the representation of food and migration in the FWWCP collection. She noted, “Reading about how food and culture reinforce identity helped me to better understand the plight of some of these groups and the importance of these recipes to their lives.” In fact, through cookbooks published within the FWWCP, Gabriela saw how writing about food and cooking not only provided a chance to showcase “the eloquence [of] those who are otherwise marginalized or ignored in society” but also represented a space to share expertise and cultural knowledge. 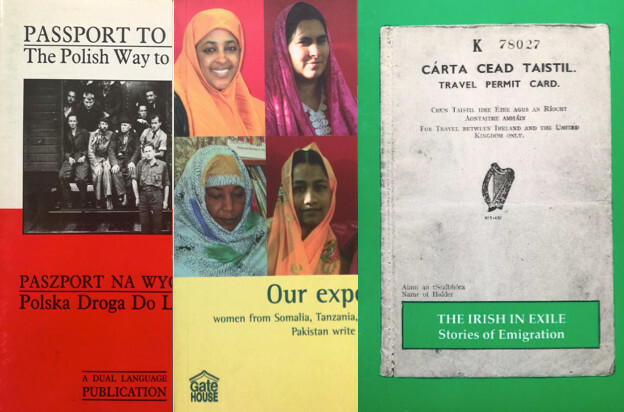 The FWWCP Collection contains numerous publications — life histories, memoir, poetry, oral history, fiction, and interviews — that explore food and migration in both English and bilingual publications. You can learn more by visiting the TUC Library. The FWWCP/FED is also on Instagram (fwwcp_collection) and at http://fwwcp.gn.apc.org. In our first blog post, we wrote about our student’s archival work to organize the FWWCP Collection. Their work was part of a Civic Writing course, where they explored how community groups address social concerns through writing. 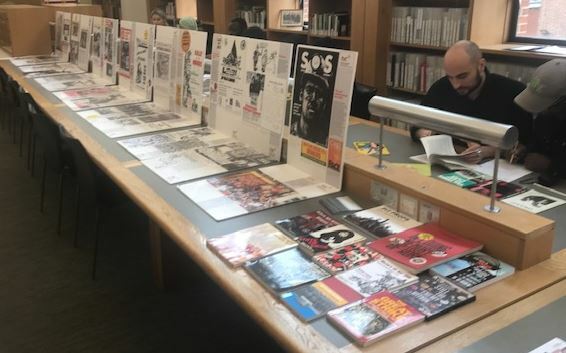 Students explored the Collection, now consisting of over 80 boxes of materials, choosing themes highlighted by FWWCP members to focus their reading, including: Art, Food, Gender, Literacy, LGBTQ+, Mental Health, Migration, Race/Racism, War, and Work. 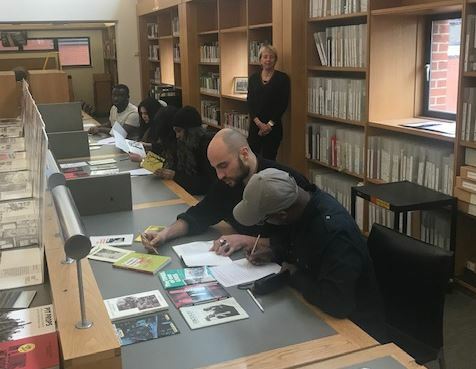 The goal was to find, read, and summarize texts within the FWWCP Collection that connected with major themes, while writing user guides for future academic and community researchers interested in working-class identity, community literacy, and self-publishing. Often, we saw how the themes overlapped in exciting ways to deepen our understandings of this unique working-class collection. For example, one student, Trenna Soderling, focused her reading of the FWWCP publications on gender in the 20th century. She noted, “These publications provide great insight into the lives that these people were living . . . Overall, I’ve walked away with a wealth of new knowledge and greater understanding of working class life in 20th century England.” One publication that stuck out to Trenna was Tough Annie, which she describes as “a detailed account of a woman’s life from her time as a Suffragette to her work as a Member of Parliament.” Indeed, Tough Annie — published by Stepney Books through interviews with Kate Harding and Caroline Gibbs — describes Annie Barnes’ contributions to the Suffragette movement, as well as her future work with the Labour Party. Amongst her group of texts related to gender, Trenna also recognized intersecting concerns of domestic life, motherhood, migration, race, politics, labour, World War II, and more. The FWWCP Collection contains numerous publications — poetry, prose, fiction, memoir, and interviews — that explore gender, identity, and LGBTQ+ issues. You can learn more by visiting the TUC Library. The FWWCP/FED is also on Instagram (fwwcp_collection) and at http://fwwcp.gn.apc.org. In recent years, the TUC Library has been building its holdings of the Federation of Worker Writers and Community Publishers (FWWCP) publications. In 2014, the TUC Library received a large donation of community publications from Nick Pollard, longtime member of the FWWCP. Subsequent donations followed. Today, the FWWCP Collection at the TUC consists of nearly 2,300 unique community publications, as well as nearly 40 years of administrative materials, including pamphlets from yearly FED Festivals, writing workshops, meeting minutes, membership applications, and more. The FWWCP Collection is a significant resource for those interested in community publishing, as well as working class histories and testimony. In the late 1970s, the FWWCP worked to create an inclusive community, whose writing, ideas, and testimony reflected the concerns of a largely disenfranchised working class. This network expanded from eight community writing groups at Centerprise Bookshop in London to over one hundred writing groups in regions of England, parts of Wales, Ireland, Spain, France, Germany, Italy, South Africa, Australia, New Zealand, Canada, and the United States. In an ongoing project, Jess Pauszek and Steve Parks have brought university students from the United States to the TUC to support the preservation of FWWCP materials. This summer, through Syracuse University’s Study Abroad program, eight students from universities, including Syracuse University, Auburn University, University of California at Santa Barbara, and Indiana University-Purdue University Indianapolis, visited the TUC Library to learn how the FWWCP’s working-class writers used writing communally for social purposes. 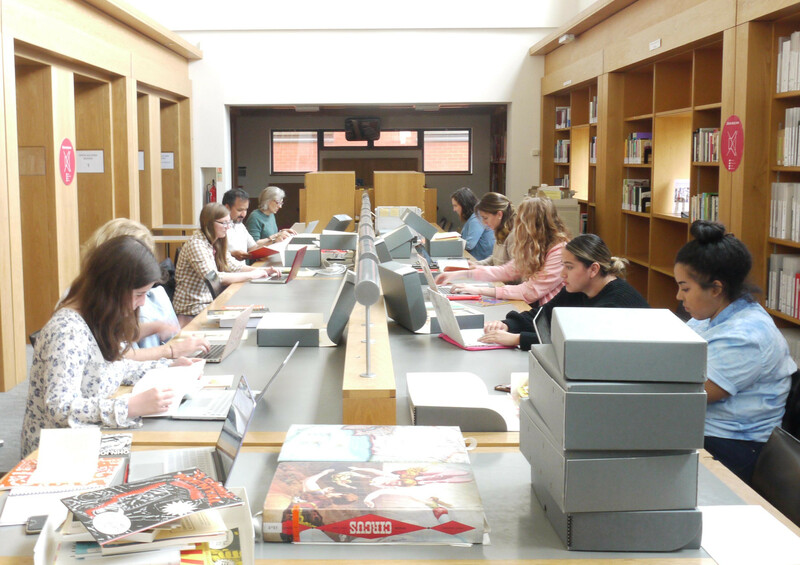 Led by Vincent Portillo and Jess Pauszek, students have been working to sort and index materials; further, they have been exploring the collection, identifying key themes within the publications, including: Art, Food, Gender, Literacy, LGBTQ+, Mental Health, Migration, Race/Racism, War, and Work. Based on these topics, students and instructors read and summarized publications to develop reading guides for future users of the FWWCP Collection, including community members and researchers alike. Survivors Poetry spread to include groups in London, Stevenage, Glasgow and more. The FWWCP Collection houses multiple publications from these groups. Additionally, Stevenage Survivors, a longtime FWWCP member, still maintains an active writing presence (check out Stevenage Survivors Poetry on Facebook). To find out more about the FWWCP Collection, you can visit the TUC, or follow the FWWCP/FED’s work on Instagram (fwwcp_collection) as well the website: http://fwwcp.gn.apc.org.